The U.S. has not had an attorney since 2009. That’s when Eric Holder, one of President Obama’s most loyal political operatives, assumed the title and office of Attorney General. But he has not been an attorney general, or at least he’s been a very poor one — by his own account. That’s a very moving sentiment from a man who is very passionate against the Second Amendment. There is just one small but significant problem with his approach: it is not the attorney general’s job to “pass” laws. The U.S. Attorney General is supposed to be the top law enforcement officer of the federal government, not the top legislative officer. The legislature passes laws. Legislators work on legislative reform. Yet, that was precisely Attorney General Holder’s focus. He was first and foremost a policymaker. Even when not working to pass legislation directly, he was working hand in hand with the president to bypass duly enacted legislation and establish policies through judicial fiat or executive action. Therefore, we saw him take unprecedented steps to promote special rights for lesbians, “gays,” bisexuals and transgender individuals (LGBT), for example. 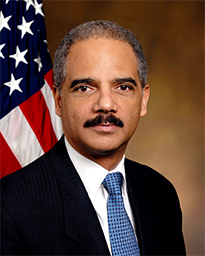 Holder was an ideologue, a radical political activist masquerading as a law enforcement officer. The work he is most proud of, that of “race relations,” was the worst disaster of all. And I say that as a Hispanic man. He and President Obama have done more to foster and increase the resentment and bitterness of minority communities than any other activist group I have seen in my lifetime. It is truly remarkable. Can anyone say with a straight face that race relations in our country are better off today than they were when President Obama and Eric Holder took office? So here is my attempt to plead with the president and Senate leadership to move away from what has been their modus operandi up until now. This is a call to look for a person who will be interested in being a law enforcement official, instead of a political operative. I, of course, have no indication that they would ever consider such a sensible option — they even messed up the “Ebola czar” in recent days. But who knows? Perhaps we can get through this time. We are not asking for the president to nominate a Republican. We are merely asking for him to consider someone interested in the job at hand, someone coming to enforce the law and not to advance political agendas. There are plenty of Democrats who can do that. But no, their first instinct is to think of Kathryn Ruemmler. Seriously? The White House counsel was just reported as knowing about the Secret Service’s prostitution scandal of 2012 ahead of time and doing nothing, or doing a very poor job of investigating. So sure, this is the person that will bring trust and confidence back to the office. How can they do that? Is the White House really this blind? It appears so. Within hours of Holder announcing his resignation, we heard Al Sharpton reveal that he is helping the White House pick the next nominee. Most names we have heard reek of the same gamesmanship. Gov. Deval Patrick, Donald Virelli, Kamala Harrias. That is not to say they would all be as horrendous as Attorney General Holder, but they simply do not inspire much confidence or hope. It looks like more of the same. And that’s the last thing our country needs. We need someone outside of the political machine. We need a true attorney general.